The Epistle to the Ephesians, or The Book of Ephesians. Paul of Tarsus is traditionally said to have written the letter while he was in prison in Rome (around 62 A.D.). This would be about the same time as the Epistle to the Colossians (which in many points it resembles) and the Epistle to Philemon. 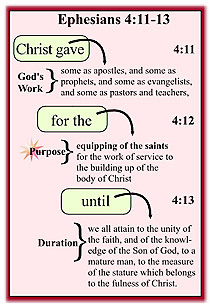 ONE, indicating unity: one new man, 2:15; one body, 2:16; one Spirit, 2:18; one hope, 4:4; one Lord, one faith, one baptism, one God and Father of all, 4:5-6.